Nepal is a holy land, blessed with four major river systems. They are: Saptakoshi River in extreme Eastern Nepal, Narayani in Central Nepal, Karnali in Western Nepal and Mahakali in Far Western Nepal. Bheri River is one of the tributary rivers of Saptakoshi River System. Bheri River is a prime tributary of Karnali River, located in the remote Far Western Nepal, initiating from the Dolpo Region and stretching through Valley of Surkhet. Then, Bheri River merges with Karnali River which later extends through the plain valley of Terai to Royal Bardiya National Park. 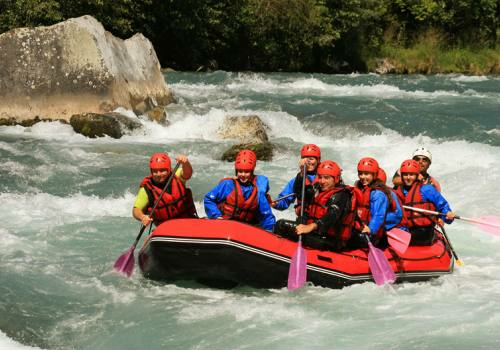 Bheri River Rafting bestows some of the best rafting rapids in Nepal. 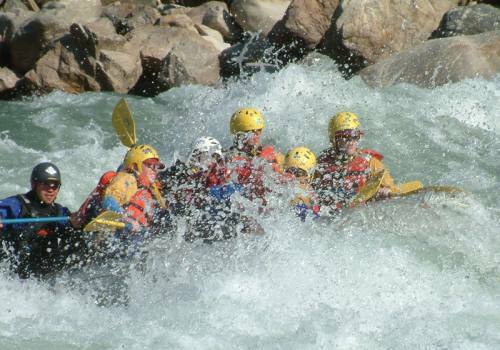 The view of hills, mountains, and woods with their diverse flora and fauna, will add much beauty to the turbulent rapids at Bheri River. Upon finishing the rafting expedition, we head to Royal Bardia National Park to experience a once-in-a-lifetime safari ride. 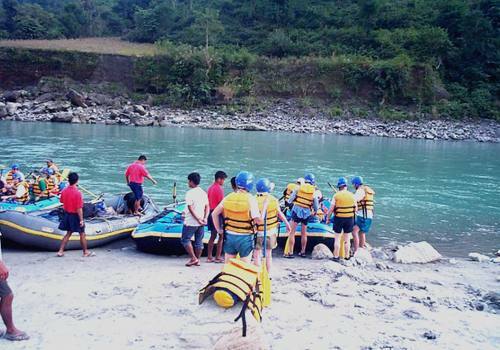 Bheri River Rafting commences by boarding a flight to Nepalgunj and driving to Samjhighat which serves as the initial point for Bheri River Rafting. Undergoing the enthralling experiences of encountering the series of turbulent rapids, we will float through spot nearby Kumalgaun and Jumu before winding up at Royal Bardia National Park. Day 02Flight to Nepalgunj, Drive to Samjhi GhatAn hour long morning flight from the Domestic Airport of Kathmandu will take us to Nepalgunj. We will drive for about 3 hours, passing through Siwalik Hill and native villages to make it to Samjhi Ghat, where we will pitch our camp to stay overnight. 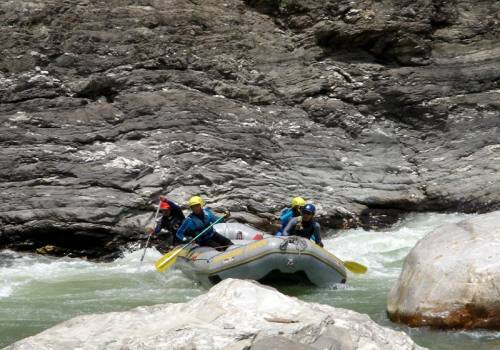 Day 03Raft from Samjhi Ghat to KumalgaunToday marks the beginning of Rafting on Bheri River. The first rapid will be encountered after about 20 minutes from the initiation point. 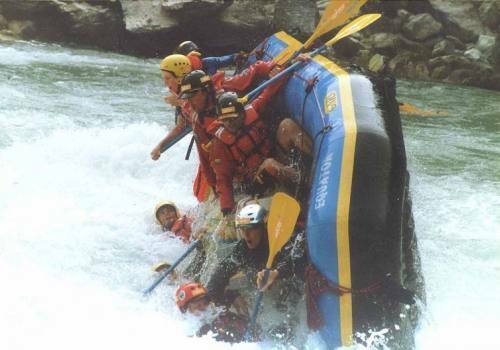 We experience several rapids and twisted bends throughout our day on the raft. Overnight in tented camp on the bank of Bheri River near to Kumalgaun. Day 04Raft from Kumalgaun to JamuThis will be the thrilling day as we will pass through a narrow gorge section with vertical cliffs of 200-300 feet on either side, before entering into an open valley. Overnight in tented camp on the bank of Jamu. Day 05End Rafting, Walk or Drive to Bardiya National ParkToday is our last day of Bheri River Rafting. An hour long float will take us to conflux of Bheri and Karnali River. 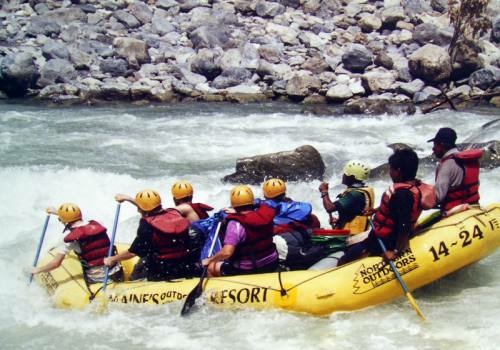 Passing through the gorge will lead us to Bardiya National Park and thus the enchanting Bheri River Rafting culminates. Overnight in hotel in Bardiya. Day 06Explore Bardiya National ParkWe wake up clean and refreshed after a good night's rest. We have breakfast and head out for a full day of exploration in Bardiya. There are several activities that we can do today. We can do a jungle safari, elephant-back ride, bird watching, you name it. There is plenty to explore in the area. Overnight at hotel in Bardiya. Day 07Drive to Nepalgunj, Fly to KathmanduIn the morning, we drive 2-3 hours from Bardiya to the Nepalgunj Airport. The hour flight takes us to Kathmandu. You can explore for the rest of the day. Farewell dinner and overnight in Kathmandu. Day 08DepartureWe will transport you to the airport. Thanks for trekking with Adventure Himalayan Travels and Treks. We look forward to seeing you again!